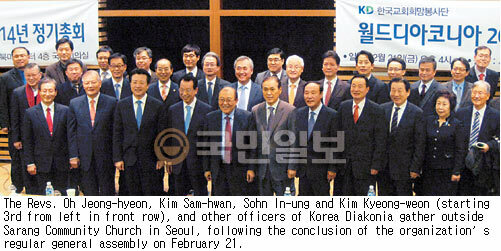 Korea Diakonia (KD; Kim Sam-hwan, Moderator) held its regular general assembly on February 21 in the International Meeting Room of the Northern Mission Center of Sarang Community Church, located in Seocho-dong, Seoul, and confirmed project plans including the strengthening of cooperation with Korean and overseas relief organizations. KD will program relief activities for socially vulnerable groups and continue its current relief ministries for Syrian and Haitian refugees. Korea Diakonia has decided to cooperate closely with the Christian Conference of Asia (CCA) and Act Alliance, an international emergency relief mission organization, through World Diakonia (Rev. Oh Jeong-hyeon, Chair of the Board), which was established as a foundation in 2012. Networking will be carried out not only with domestic churches but with organizations in the overseas mission field as well, in order to act swiftly when disaster happens. World Diakonia has also decided to strengthen cooperation with the Korea NGO Council for Overseas Development Cooperation (KCOC), the Korea International Cooperation Agency (KOICA), and the U.S. Agency for International Development (USAID), for development assistance projects. Tasked with in-country ministry, Korea Diakonia will continue its fundamental welfare work such as helping multicultural migrants to settle in, assisting low-income residents to become self-supporting, and aiding atomic bombing victims. It will also continue projects to assist North Korean defectors living in South Korea, such as opening a mothers’ school for mother-and-child families, and will provide humanitarian support to residents of North Korea. The Korea Diakonia assembly also approved the reconstruction project plans of the Korean Church United Relief Mission for the Philippines (KCU Relief), which was organized to aid the Philippines following its extensive damage during last November’s super typhoon Haiyen. World Diakonia will use the 1.2 billion won it has collected in offerings from the Korean churches, for reconstruction of churches, schools and homes and distribution of Bibles in Leyte, Cebu and other devastated areas of the Philippines, by the end of this year. Specifically, it will provide 380 million won to rebuild elementary schools and another 200 million won to rebuild churches in the hardest-hit areas of Leyte island; 400 million won for reconstruction of 300 houses in northern Cebu; 150 million won for projects helping residents of damaged areas become self-supporting; and 20 million won for Bible distribution in the devastated areas.